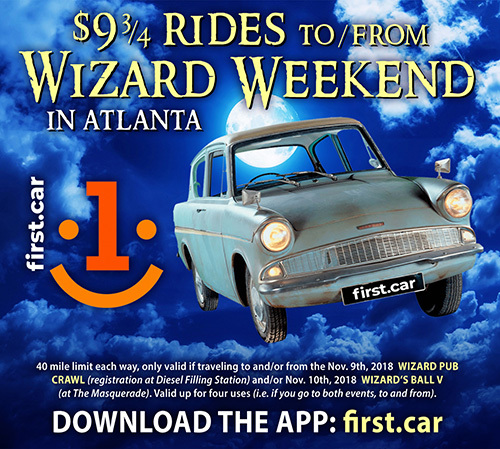 Atlanta Wizard's Ball: Great deal offered by first.car transport services for this weekend's events! Great deal offered by first.car transport services for this weekend's events! Need a ride to WIZARD WEEKEND? Atlanta's new first.car service is offering $9 3/4 rides (up to 40 miles one way! )...up to four uses...for those looking to travel to Wizard Pub Crawl #4 (Atlanta 2018) on Nov. 9 and/or Wizard's Ball V (Atlanta, GA) on Saturday, Nov. 10th. • Download the app at www.first.car and tell them Markster Con sent you! NOTE: Only valid if traveling to destinations of events (Diesel Filling Stationon Friday, The Masquerade on Saturday).